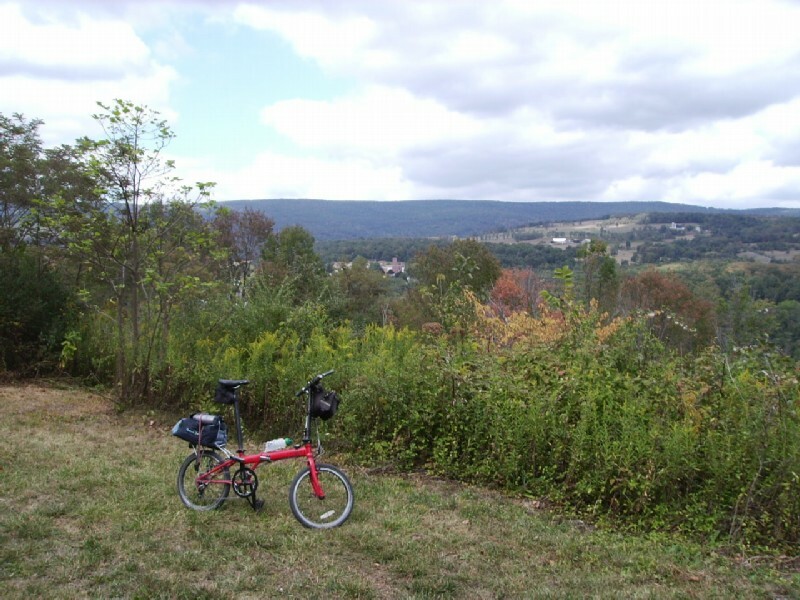 Day 5: Meyersdale to Cumberland - mileage 34 - weather dark clouds and threatening early, then sunny and pleasant. 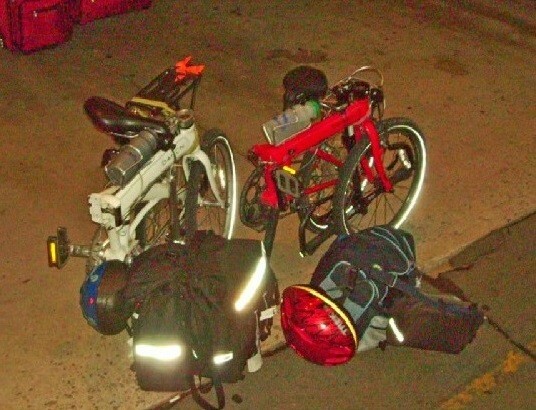 Departing the Yoder "Motel" in Meyersdale. 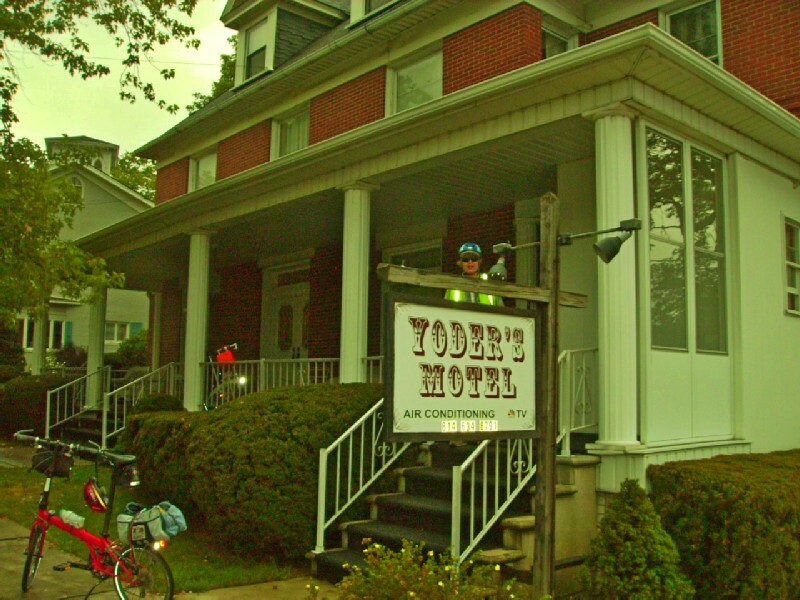 The Yoder is more like a B&B without the breakfast. This was the second time we stayed here and liked it just as much as the first time. 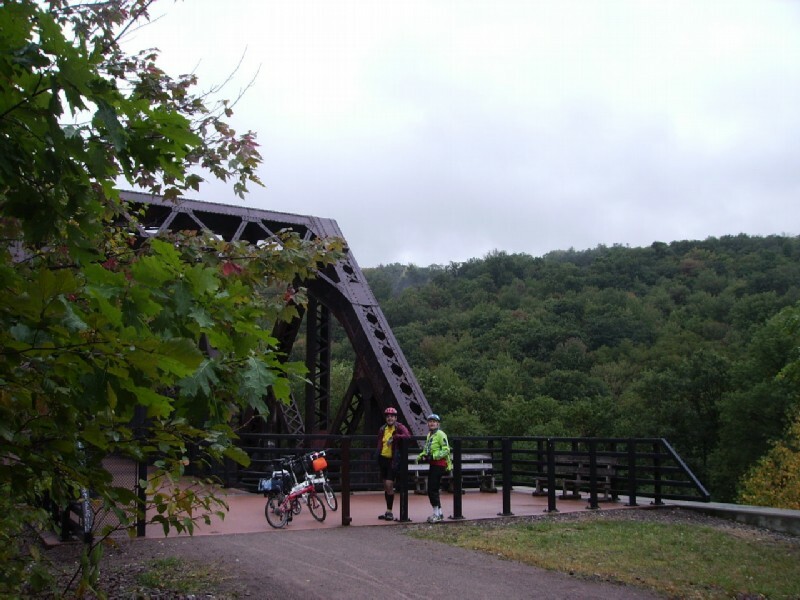 Although it was a steep downhill from the trail, as is all of Meyersdale, it was convenient to all services. 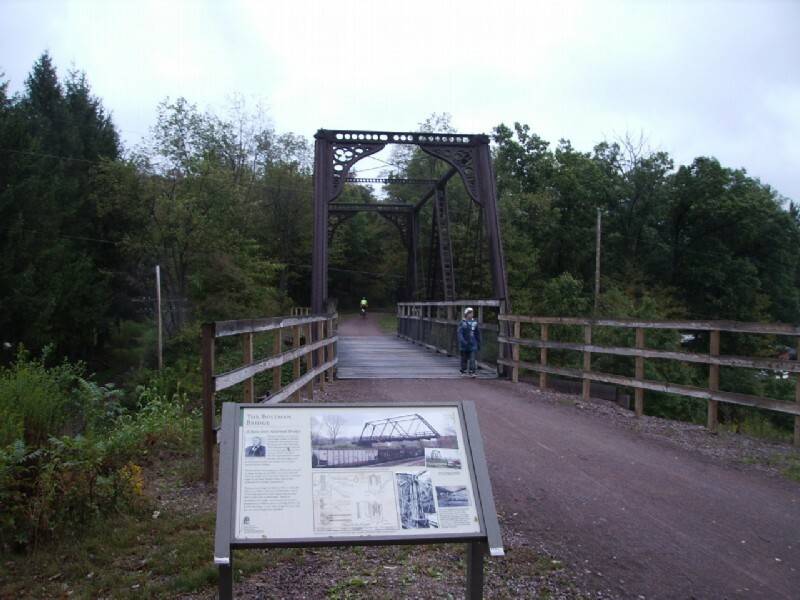 Bollman Bridge that crosses a road east of Meyersdale. The plaque describes how the bridge had been moved twice before settling on the GAP. Last time we had to drop down to the road on a rough track, cross the road, and then go back up a rough track to the trail. The west end of the Keystone Viaduct. 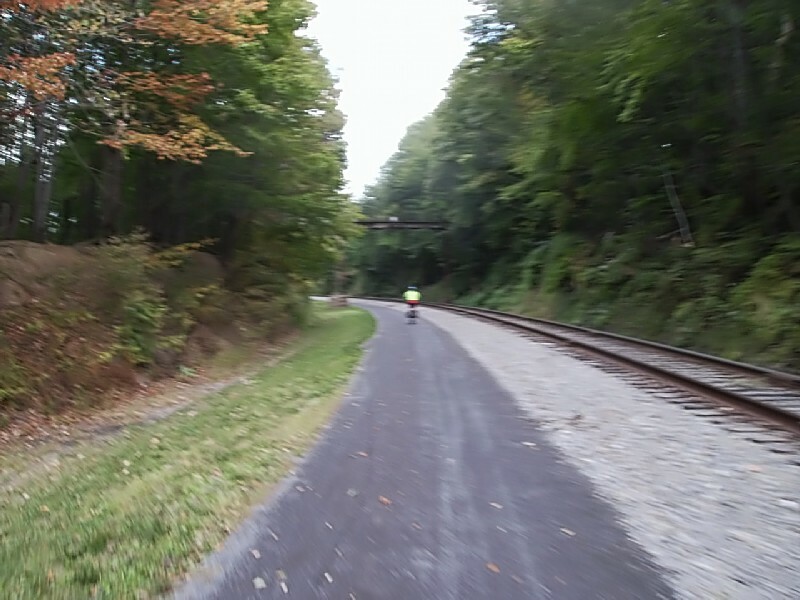 Like the longer Salisbury viaduct, this one also crosses the CSX RR, a road, and a stream, this time Flaugherty Creek. The Keystone Viaduct is another very interesting curved bridge. Just before the continental divide. Only one of many civil engineering exhibits. View from the east portal of Big Savage Tunnel. Who dah thunk it! 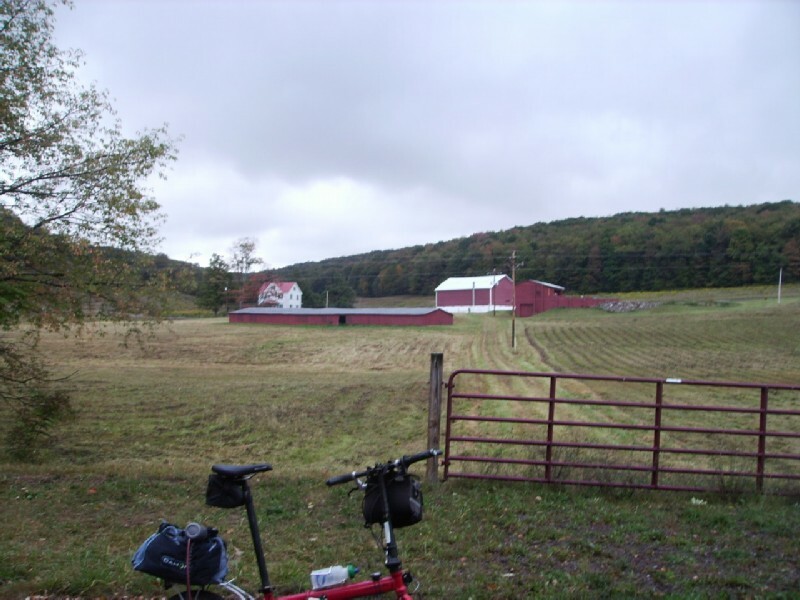 We had been going uphill almost imperceptibly for four days; and the last we saw on the other side of the tunnel was relatively flat farm land. 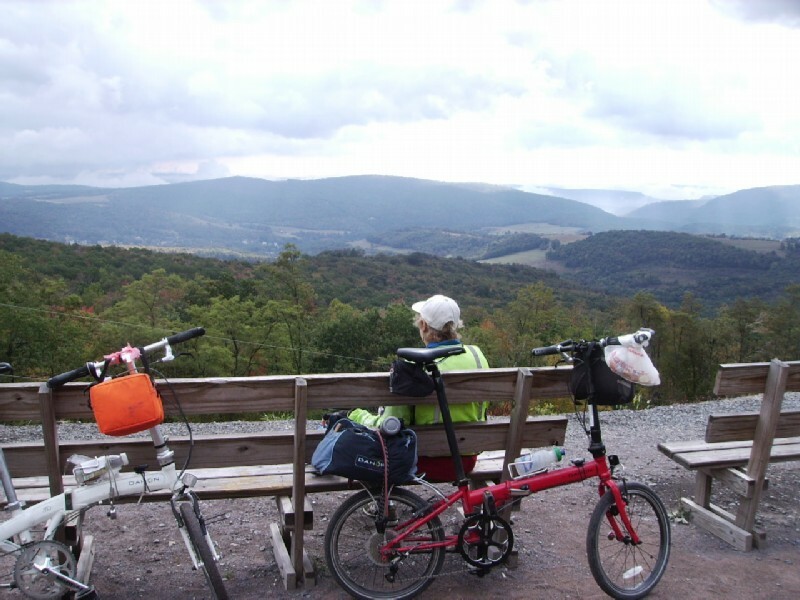 When we reached the trailhead below Frostburg, we decided to climb the hill to a cafe near the Maryland Scenic RR station nearer to downtown Frostburg. After a coffee and Danish, as we were heading back to the trail the tourist train made its appearance. The steam engine turned a partly cloudy morning into a foggy one. 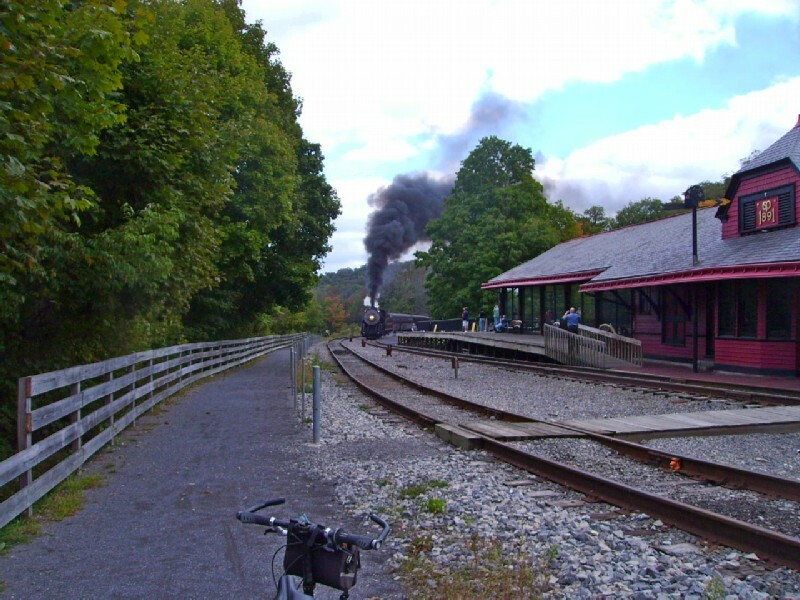 Roll-on, roll-off bicycle service provided by the Maryland Scenic Railroad. 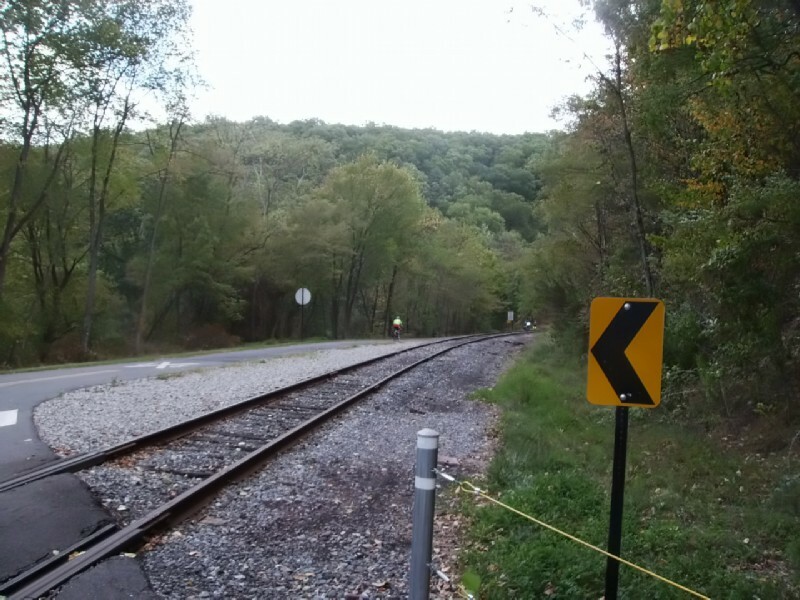 After crossing over it twice, the Maryland Scenic Railway tracks finally joins the trail about 1.2 miles from the Frostburg trailhead. 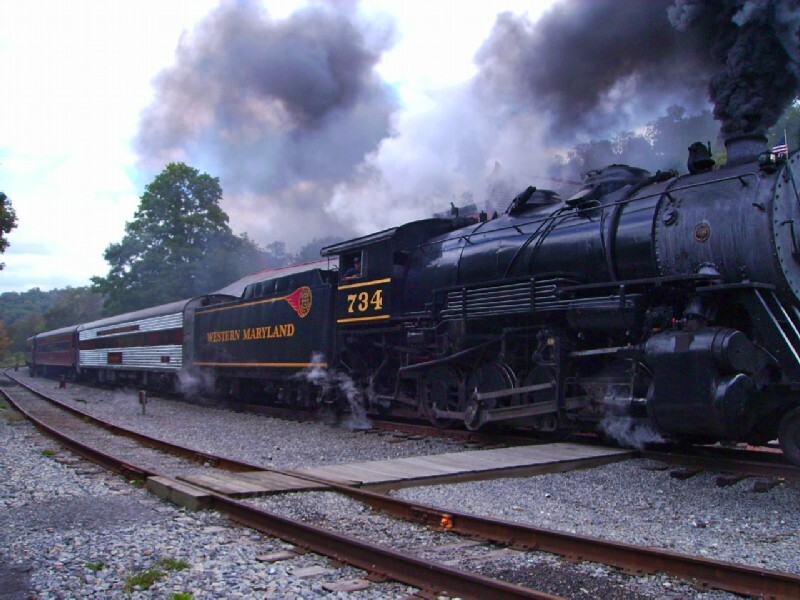 Actually, the route into Frostburg was the Cumberland and Pennsylvania RR, a competitor to the Western Maryland. 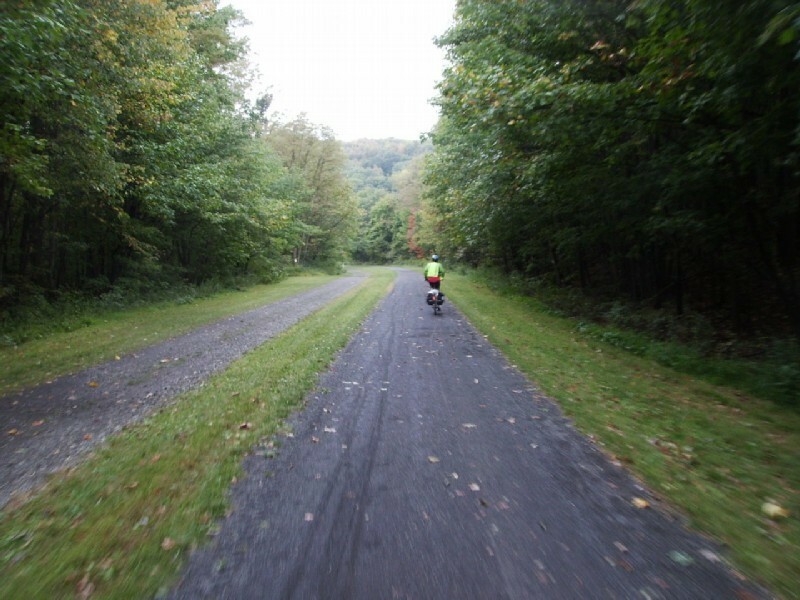 The trail crosses the tracks several times between Frostburg and Cumberland. Being a nice Sunday midday, we encountered quite a few cyclists coming up the hill. 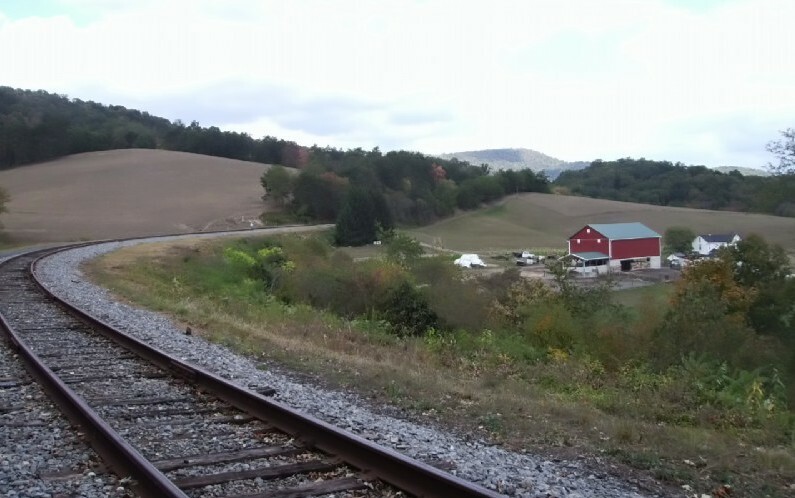 Helmstetters Curve, a favorite photo op of rail fans. 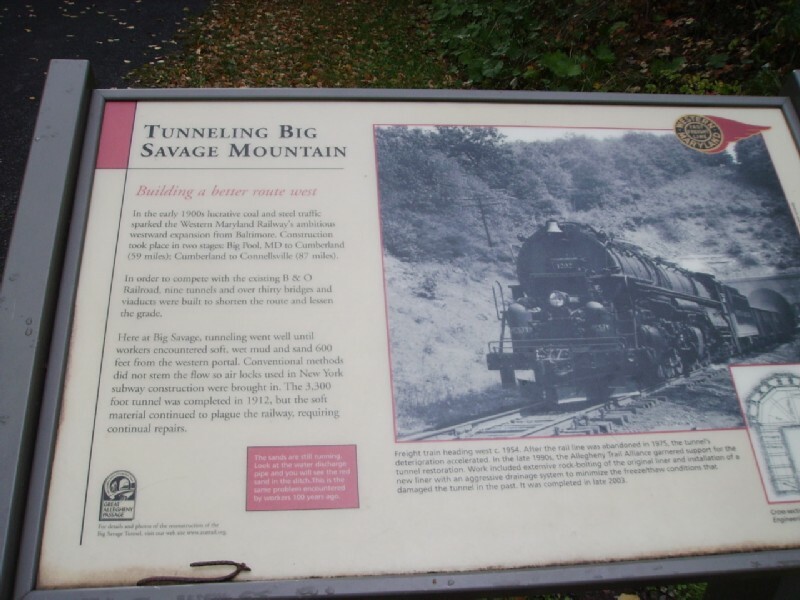 From the east portal of Big Savage Tunnel, the trail has been sliding down the side of the mountain towards the Cumberland Narrows, a hole in the mountain accommodating two rail lines, a road, and a creek. Here you can see the cliff on the East side of the Narrows. 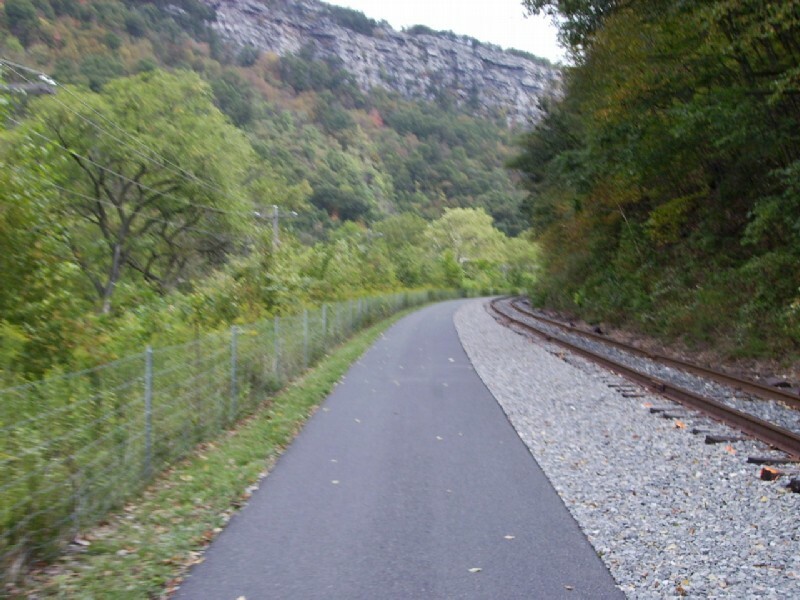 The trail will continue to slide into Cumberland by itself along the West wall. 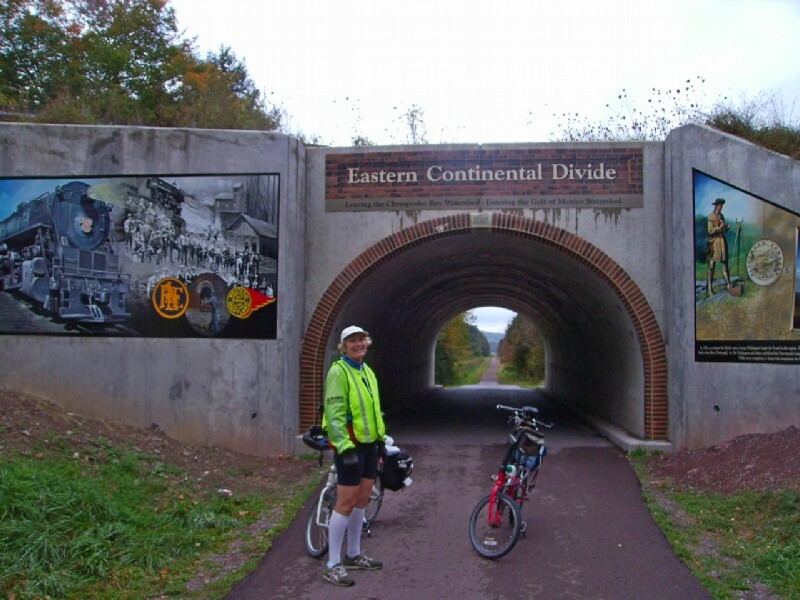 The former Western Maryland station marks the end of the GAP and start of the C&O trail. 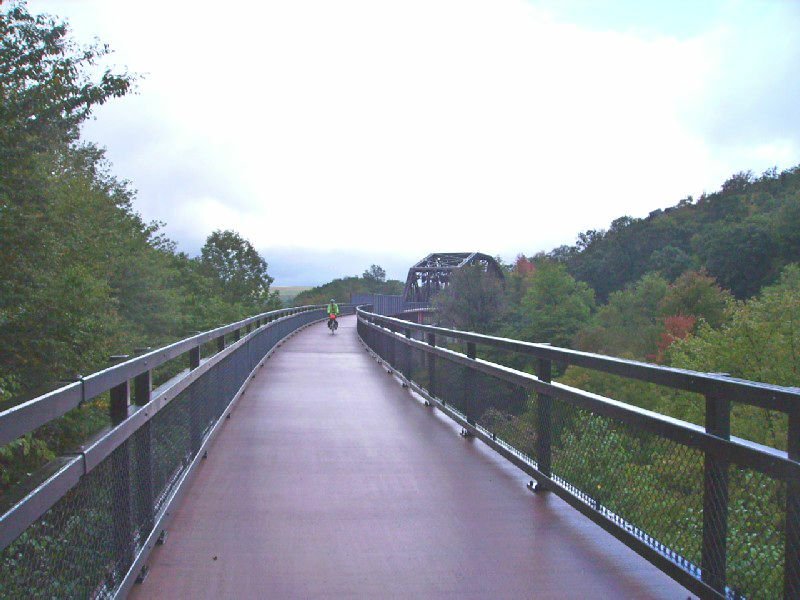 It houses the C&O Canal visitor center in addition to the Scenic RR station. 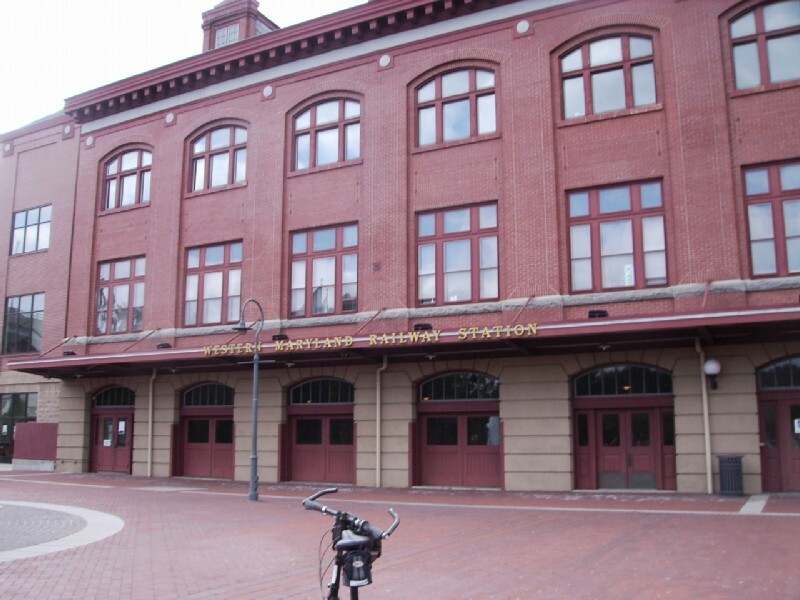 The Cumberland Amtrak station, sometimes referred to as an Amshack, was nothing compared to the WM station. 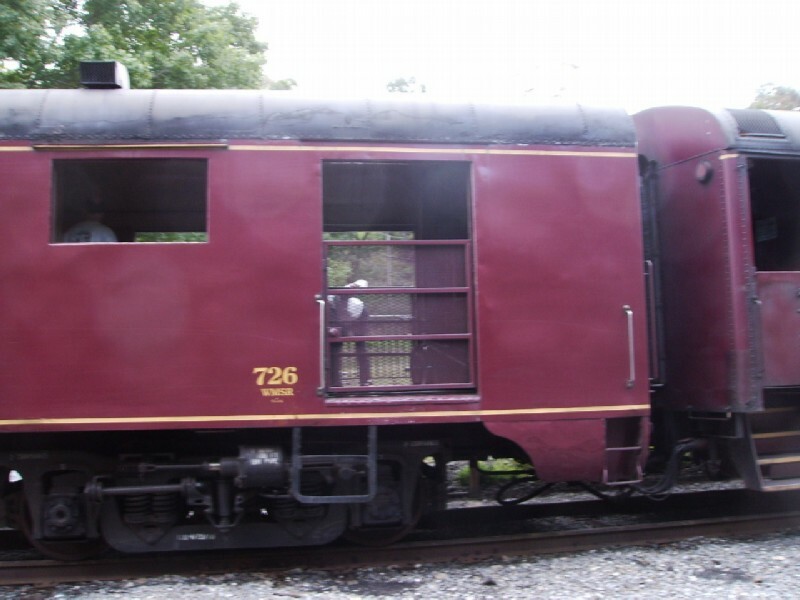 But, if small, it was in decent shape and had a ticket counter, baggage room, and rest rooms, but no agent. 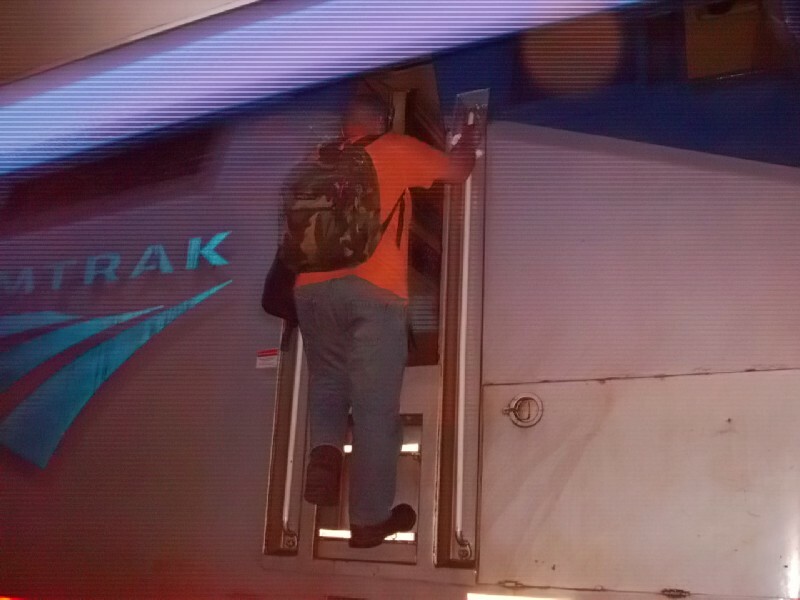 The large number of waiting passengers took up almost all the seats. The station has a strange address, 2 Queen City Pavement. It made sense in that the platform was actually part of a sidewalk from one neighborhood to another with a steady stream of characters passing by. As a local wag put it, it looks like a preview of haloween. We got a new engineer in Cumberland. Chicago harbor viewed from the Navy Pier. 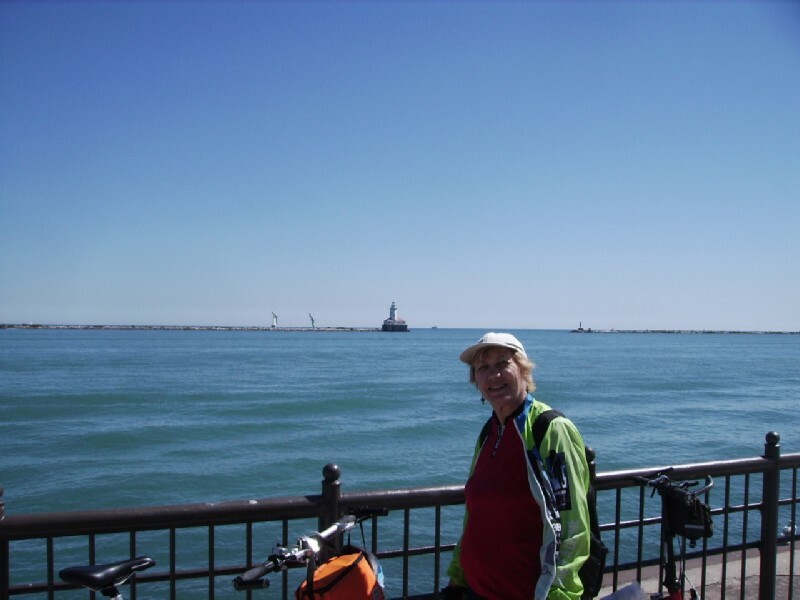 As usual we took advantage of the layover in Chicago to take a ride on the lakefront.